Elevators are incredibly dependable machines, but occasionally, as with any technology, mechanics malfunction and normal operations are disrupted. Typically, this takes the form of a “stuck” elevator. While such issues are usually resolved quickly, being stranded on an elevator is an inconvenience, not to mention a potentially frightening experience. The following steps outline the best way to handle such a situation to ensure the comfort and safety of everyone aboard. Firstly, try to remain calm. If panic sets in, try taking a deep breath to collect yourself. Remind yourself that reports of people being injured in stalled elevators are incredibly rare. Try to provide moral support to anyone in need. Remember, a clear mind is more equipped to solve problems. If the lights go out, use a flashlight on a cell phone or keychain to illuminate the space. Next, check to see if the door can be opened mechanically. Press the “Open” or “Door Open” button. Sometimes this will cause the elevator to open. If the elevator is level with a floor, you can exit. Be sure to press (or pull out) the “Stop” button before trying to exit. This is an important measure that prevents the elevator from moving. If the elevator is not level with a floor, do NOT attempt to exit. If the elevator door does not open, try pressing the button for the floor directly below you. 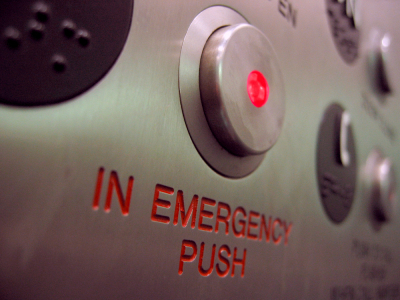 Press the phone button to call a technician or use the elevator’s emergency telephone. If a technician is not available, try pressing the alarm button. You can also try yelling for help or removing a shoe and using it to make sounds that could alert someone to your location. Try using your cell phone to dial 911. If reception is unavailable, try different parts of the elevator. At this point, if no one has assisted you, try waiting it out. It is likely that someone will notice that the elevator is stuck before much time has passed. If you find yourself waiting for an extended period of time, try to mitigate any discomfort or boredom by playing cell-phone games, doodling, reading, writing and getting to know fellow passengers. And there you have it; the steps for surviving in a stalled elevator. Be sure to follow SEES blog for more fascinating stories and useful information.